Make math meaningful with these fun projects that allow your students’ creativity to shine! 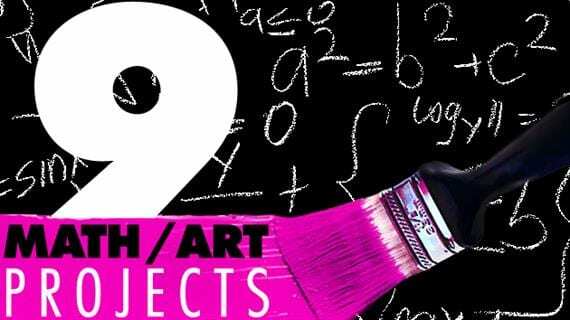 Integrate math and art with this collaborative project. Divide students up into groups. First, students map out their design on graph paper, creating a multiplication array. Their design can be square or rectangular. When they’re finished sketching it out, have them write down the equation for their array. Next, have students figure out the area and perimeter of their design. Then, they figure out the fraction for each colored Post-it Note they will use. Once they’ve completed the math, they construct their design! 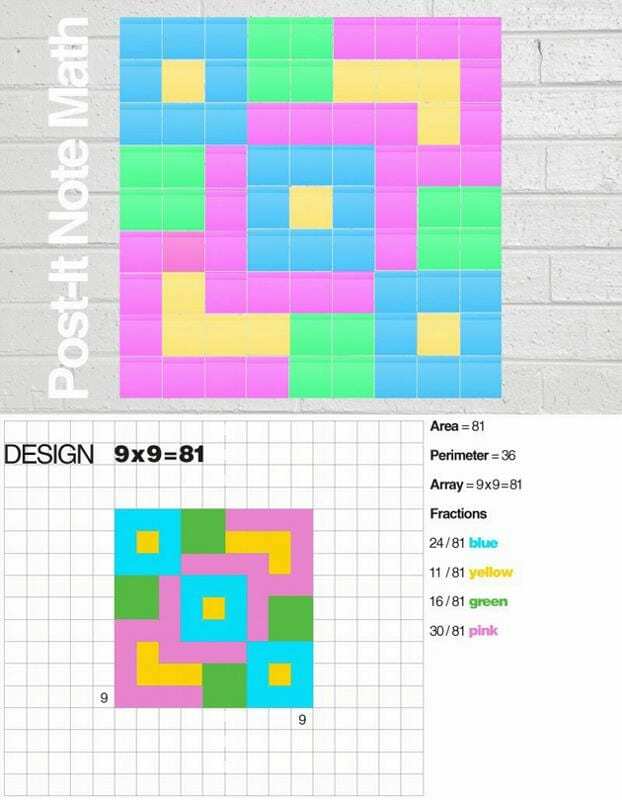 They will create wall art using Post-it Notes. Their design will help guide them through the construction process. Students explore fractions while writing a colorful melody, without even knowing how to read music! 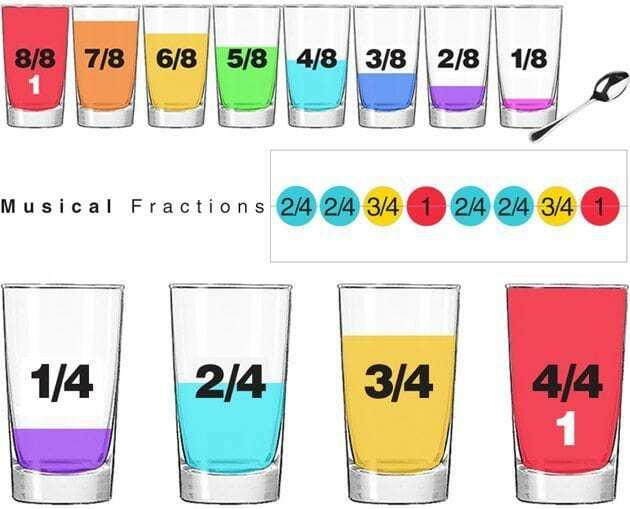 Fill glasses up with different fractions of water and add food coloring. Provide students with paper to write their songs. Have kids formulate a hypothesis about why the glasses of water project different sounds. Is it the color of the water? No! Students will be wowed at how water level makes an impact on the sound that projects from each glass. The fraction of water in each glass produces a different pitch. 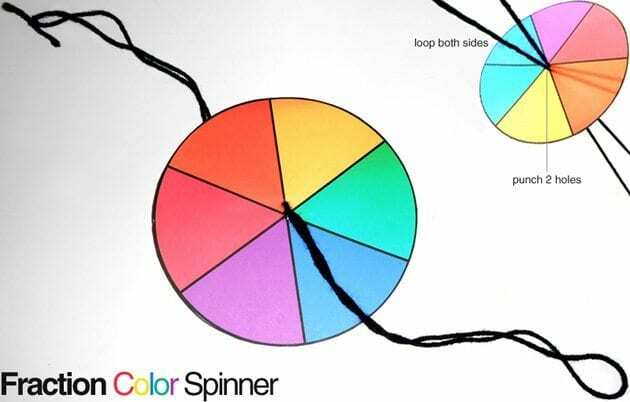 Integrate math, art and science by creating a colorful spinning toy! Kids trace a circle (at least 6-inch diameter) on poster board (or cardstock) and divide it into six equal parts. Then, they color it in, using any colors they’d like. Once it’s colored, an adult punches two holes in the center of the circle. Kids measure out a 3-foot piece of string or yarn and lace it through their circle. Move the circle towards the center of the yarn (keep the one side of the string in a loop—don’t pull the string all the way through). Next, tie a knot on the other side so it has a loop. Then, twist the string up by flipping the circle round and round. Pull the string outward and let it unravel. Watch it spin and the colors mix! Students construct a fish out of a circle, using a protractor to create its mouth (make sure each kid creates a different angle). They cut out the angle, and the chunk of paper becomes the caudal (tail) fin. To play a fun game, attach magnets to the fish. Then make a fishing pole using a stick with yarn and a magnet attached to the end. Students go fishing for angles! 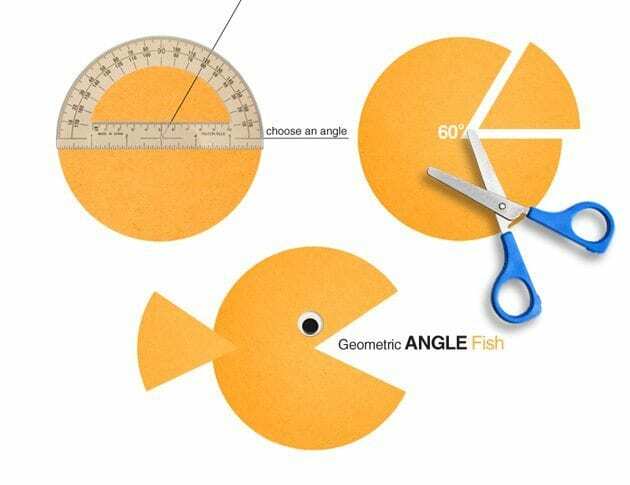 When they catch a fish, they use a protractor and figure out the angle of its mouth. They write down the type of fish they caught (e.g., 30-degree angle). They keep their fish. If they can’t figure out the angle, they throw their fish back! Whoever has the most fish wins! Give students different colors of construction paper. They cut 1-inch-wide strips. 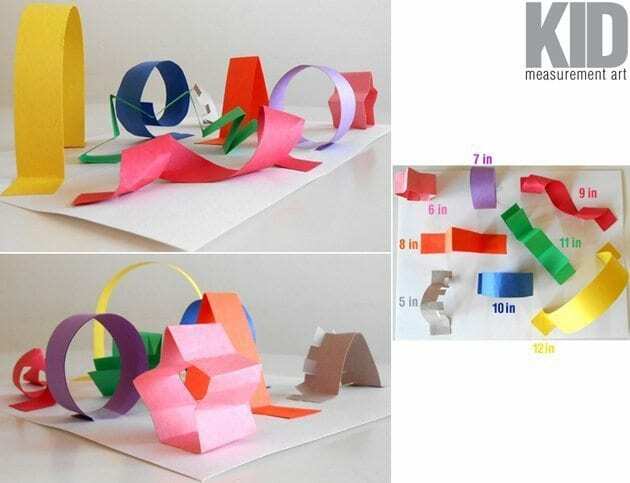 Then, they use a ruler and cut their strips in different lengths (5, 6, 7, 8, 9, 10, 11, 12 inches) and manipulate them into different designs, creating a 3-D collage. They write down their measurements next to each paper strip. Integrate math, art and science all in one craft! 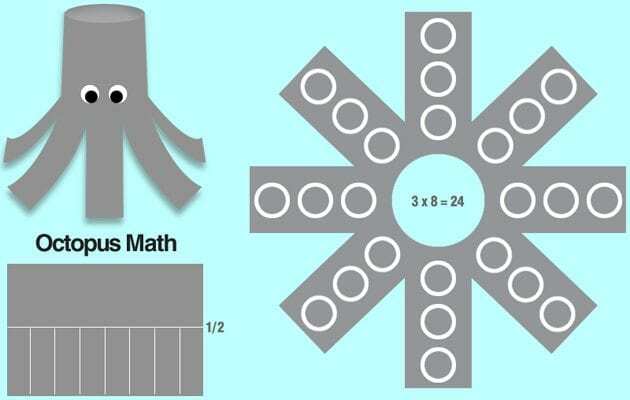 Kids create an octopus while exploring division, fractions and multiplication. First, they divide a piece of construction paper in half. Next, they use a ruler and draw lines (on half the sheet) to create eight rectangles for the arms (see image). They cut along the lines they drew, stopping at the halfway mark. Then, they curve the paper and staple. Once stapled, they bend the arms, so the octopus can sit up. After they’ve created their octopus shape, they flip it over. They stick round reinforcement labels (white circle stickers with a hole in the center) on the back of its arms and create suction cup arrays (see image). Then, they figure out the multiplication equation for their octopus. Science: This craft can be used for an animal adaptation unit. Kids learn that octopi have arms (not legs). The suction cups on their arms help them grasp their prey, move along rocks and taste things! Also, the octopus’s stomach is on top of its head! Its mouth is a hard beak (don’t let children draw a happy face on their octopus—the beak is underneath!). 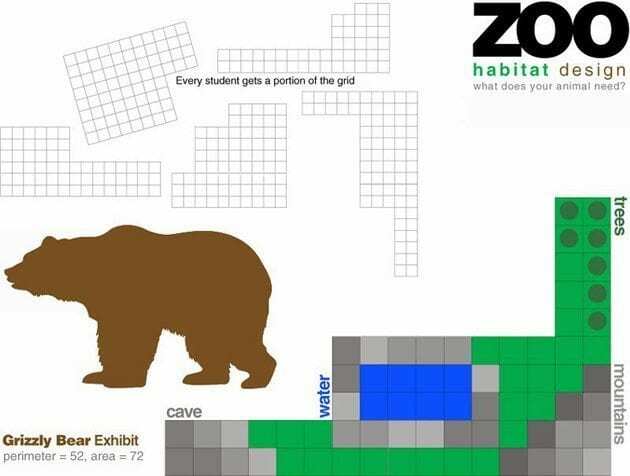 Students collaborate and create a giant zoo. First, tape sheets of grid paper together (cut off the white borders). Next, cut out various irregular shapes off the giant grid for the students (see image). Give each student a piece from the grid. Their mission is to figure out the area and perimeter of their land for their exhibit. They choose an animal and plot out important aspects of its habitat. Does their animal live in the Arctic, forest, grasslands or rain forest? Students think about what colors to use to correctly match their animal’s habitat. They must make their animal feel at home in its exhibit. Does their animal play in the water, hide in a cave or roll around in the mud? They add details to the exhibit. Then, they find an image of their animal online and glue it into the habitat they made. When all of the students are finished, they work together and create a zoo! They problem-solve where each animal should go. Should the rhinos be near the elephants? Then they glue their designs on an oversize sheet of butcher paper. They add paths, signs and fences. 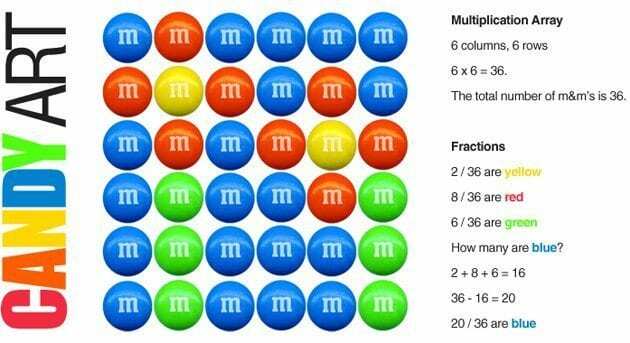 Explore multiplication and fractions by creating a candy art array. Students create an image using colored candy. They must use their problem-solving skills because their candy must line up evenly to create an array. When they’re finished with their candy picture, they write down the multiplication equation that matches their array. Then, they write down the fraction for each color they used. Visit Candy Art for more intricate designs to get kids inspired! Note: For this activity, split kids up into teams. Then they can collaborate and create larger designs. Fun place value idea from Teachin’ First. Students use paper base-ten blocks to construct an original design. They could make a robot, rocket ship, scenic landscape, an animal or even a TV! Then, they figure out their number. Visit Teachin’ First for a free paper base-ten-block printable to go along with the activity. 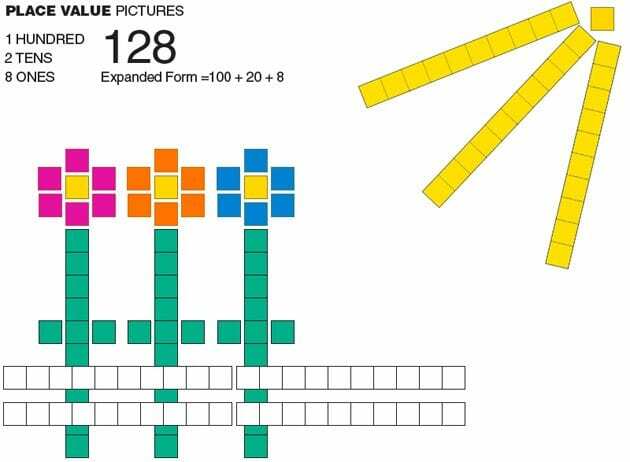 You can use the paper base-ten blocks to create place value initials! Click here for details. Erin Bittman is a student at the University of Cincinnati. She is a student teacher in a multi-grade classroom (second and third grades) at a magnet-themed school. Check out her blog E Is for Explore!